product design according to customers' requests - TSY Molding Limited : injection molding supplier, China mold maker, unscrew mold, over mold, plastic product co-design from concept/prototype to your actual sales in global markets. We provide plastic Part Design and Product Development services. The key to successful Plastic Product Design and Development is speed and experience. Our full suites of software provides a predictive tool for mold design analysis. Rapid Prototyping capabilities to reduce the product revision development cycle. Speed to market is critical for the success of your project. To decrease program lead-times, TSY Molding Ltd. has created cross-functional engineering teams that have specialists in mold design, plastic injection mold processing and program management. Instead of working on your project in a sequential manner, each team member begins with their area of expertise when the project is launched. This results in early problem detection, better informed customers and reduced part design revisions. When you combine highly skilled engineers with the proper Product Design and Development tools, you will get great results. That’s exactly what to expect when you work with TSY Molding Limited. Parting line re-design can have cost reduction. - With undercut and cannot be demolded features change elimination. - Insert and mold parting line.Wall Thickness of plastic products design is important. Draft angle must and should be applied on part design in direction of draw to avoid scatches when demolding. Heavy texture requires larger draft. Some plastic part product designers may overlook it, thus inducing poor quality molding parts in final with additional cost to remedy. 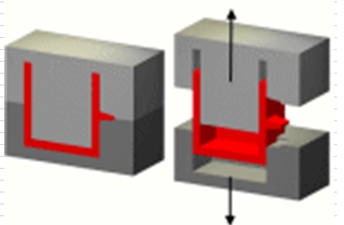 ​Non-uniform wall sections can contribute to warpage and stresses in molded parts. @ Sections which are too thin have a higher chance of breakage in handling, may restrict the flow of material and may trap air causing a defective part. @ Too heavy a wall thickness, on the other hand, will slow the curing cycle and add to material cost and increase cycle time. 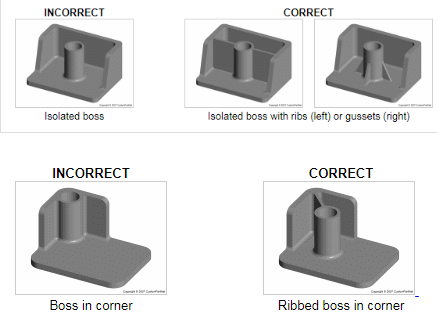 Wall thickness of bosses should be no more than 60% of the main wall thickness. Radius at the base should be at least 25% of the main wall thickness. ​Your design should fit the injection molding process to be performed by machines and robotics The overheads are significantly reduced, this cost saving can easily be passed on to the customer. Using injection molding also ensures the parts manufactured hardly require any work after the production. Select environment-friendly plastic material of which the scrap plastic generated during the production process can be reground and re-used. ​Hence, the process generates very little waste. The material selection process can be as simple as an internet search for the material of an existing part already on the market, or as complex as identifying every single requirement and material property from the ground up. The first step is to define the requirements needed for your particular application. From there it's important to narrow the choices by process of elimination. @ Do you need it to be rigid, flexible, elastomeric etc? @ Is there a specific application? Medical? @ What specific property requirements are there? Sometimes the best thing to do is to not reinvent the wheel and do a search history for similar commercial applications if possible, then call up the material supplier for recommendations. Gate location is the area where the material will be entering into and filling the cavity of the part. It is important to keep in mind where you intend to gate your part and possibly make provision. @Am I allowed to have a gate mark where I am envisioning my gate? @ Is this gate at a location where the material will flow from a thick walled to a thin walled region of the part. @ You must also account for ejector pin marks that will most likely show up on the underside of your molded part. If ejector marks are not allowed then that must be called out on your print so other ejection alternative can be considered. Difference in wall thickness due to ribs, bosses or other features causes sink marks. Ejection cause pin marks & scratches in the cosmetic surface. Gates marks on the surface. Flashes from parting line or vents. Burn marks due to incomplete venting appear on surface. Slides and inserts leave undesired witness lines on surface.Visible weld lines on surface. Differences in color due to wall thickness variation. Rough surface exposure for catching dirt, UV and chemical.